Basic objective of this article is to discuss Theories of Deviance. 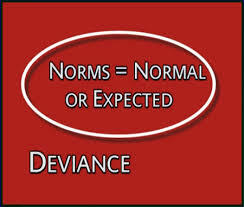 The concept of deviance is complex since norms vary considerably across groups, times, and places. In other words, just what one group may consider acceptable, another may consider deviant. Several theories related to deviance as well as criminology have emerged in the past 50 years possibly even. Four of these are well‐known they are Differential-association theory, Anomie theory, Control theory and Labeling theory.